The scope of this project is to envelope the other parts of the OFFshore ITRH and apply engineering statistics and modern data analytics to enhance facility whole life performance. The project is initially tailored to support mooring integrity management and vessel motion forecasting due to concerns over the relatively high rates of failure. 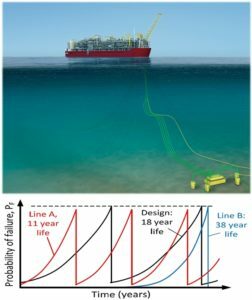 A life cycle reliability approach is being explored for FLNG and FPSO moorings taking advantage of recent advances in data analytics that have been applied to other industries. This includes the use of field data to design and train tools that drive operability-related decision-making, and asset condition assessment through intelligent analysis of field data. This project will use input field data provided by the Hub Partners, including environmental and vessel motion data from existing floating systems. The aim of this project is to establish use data analytics, combined with the engineering models from Projects 1-4, to improve operability and longevity/condition assessments for floating facilities. Small increases in annual operability give proportionate increases in production which potentially yield huge project economic gains.